If you are newly retired or planning to retire soon, you may be concerned about changing your daily routine. 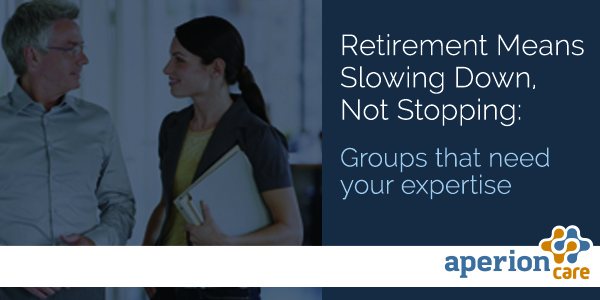 Many retirees fear becoming obsolete or losing skills they’ve honed over the duration of their careers. Additionally, leaving the workforce may lead to social isolation, which can be a danger to emotional and physical health. Don’t worry! There are many groups that need your lifetime worth of experience, insight, and specific skill set to help them grow in the right direction. From legal assistance, financial or tax advice, to something as simple as a listening ear… here are some organizations that want your help. “Every year, SCORE volunteers help thousands of entrepreneurs start small businesses and achieve new levels of success in their existing businesses. Volunteering at SCORE is a way for you to give back to your community, connect with fellow business owners, and pass on your knowledge and expertise to the next generation of entrepreneurs in your community.